“No one has ever won Female Vocalist of the Year three times. Wait. Norah Rendell just did. We became aware of her with Outside Track, and since leaving the group sometime back, she has gotten better-as if that were possible. Her voice is as true as are her musical values. We can listen to Norah sing all day. Wait. We have. 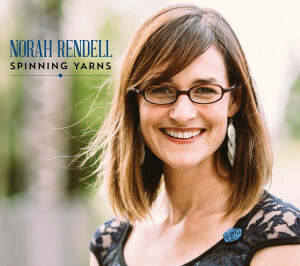 Her new album, Spinning Yarns, is a project of which she can be proud. Keep your eyes out for her musical pals, Norah Rendell and The Lost Forty, on tour. She somehow finds time for family AND running one of the most successful music schools in America, The Center for Irish Music in Saint Paul. She is wonderful. End of statement, end of story.” – Bill Margeson. Read the original article including other recipients of the 2016 Top TIR Awards here (page 20 & 21). Congratulations to Máire Ní Chathasaigh, Buttons and Bows, Colin Farrell, James Keelaghan, Dallahan, Jeremiahs, Tom Byrne, Joe Gibney and Connla for being named for the other 2016 Top TIR (tradition in review) awards! Listen to an in-depth interview about Norah’s new album, “Spinning Yarns” with MPR The Current’s Radio Heartland host, Mike Pengra.